The new course! 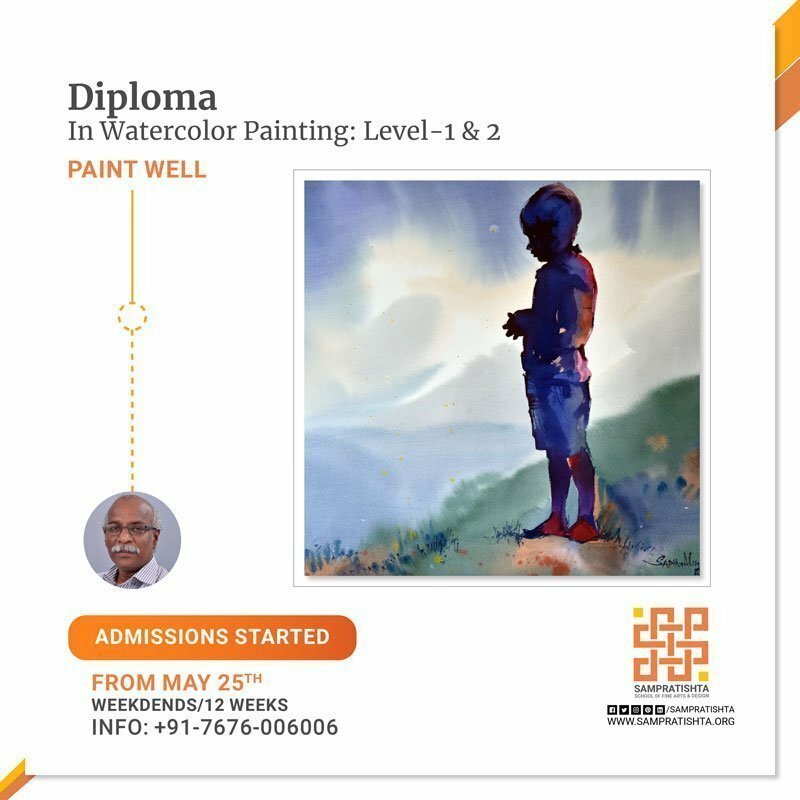 Diploma in Watercolor Painting! A depth study of watercolor painting. 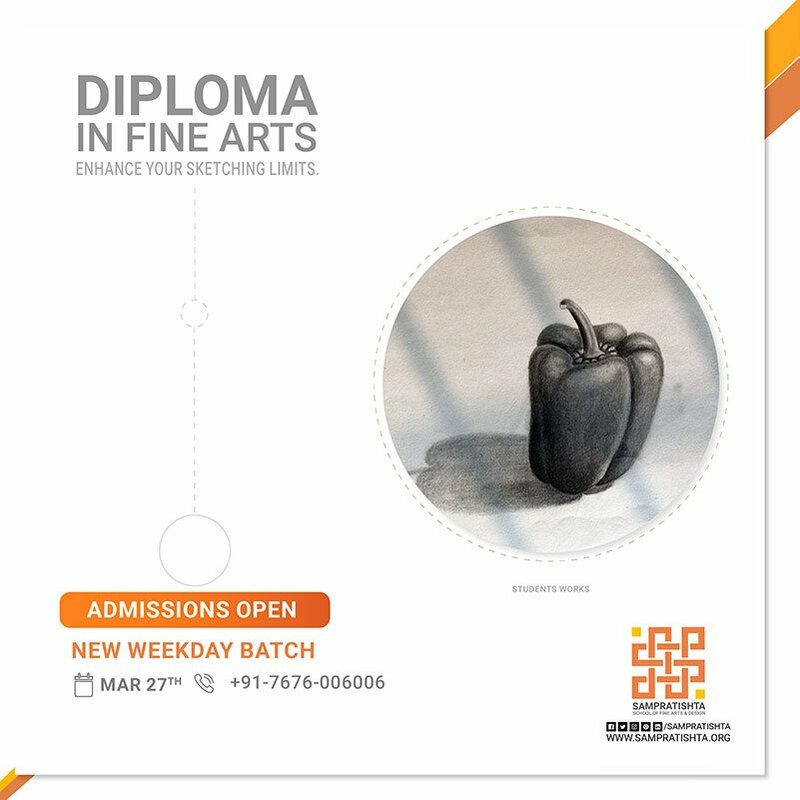 Visual Arts Diploma watercolor course offered by Sampratishta School of Fine Arts & Design is for individuals wanting to pursue higher education under fine arts streams. The knowledge of basic sketching skills is an added privilege to master watercolor. Level 1 is a perfect step for both beginners and intermediates. It involves developing art and design techniques using the Watercolor medium. We teach in-depth about the essential skills techniques for watercolor and developing the most effective skills to produce an artwork. With this training, students are exposed to greater levels of understanding and can see advancement in their watercolor painting and fine art skills. Shri. Sadhu Aliyur, doesn’t need any special introduction, a best teacher and International watercolorist. Become a confident painter with your extensive practice. Diploma in watercolor painting course will discount certificate from the institute. Please note, it’s not affiliated with any of the university yet. You will be having 12 finished assignments to complete and submit. And your every assignment will carry 7 marks in total 84 marks. And your final exam test will have 44 marks. You can score most 140 marks. We may take a test to understand your skills. The medium used here for the artwork is watercolor. You will be having 16 finished assignments to complete and submit. And your every assignment will carry 8 marks in total 120 marks. And your final exam test will have 45 marks. You will need to wait for the invitation mail from institute to complete the admissions. 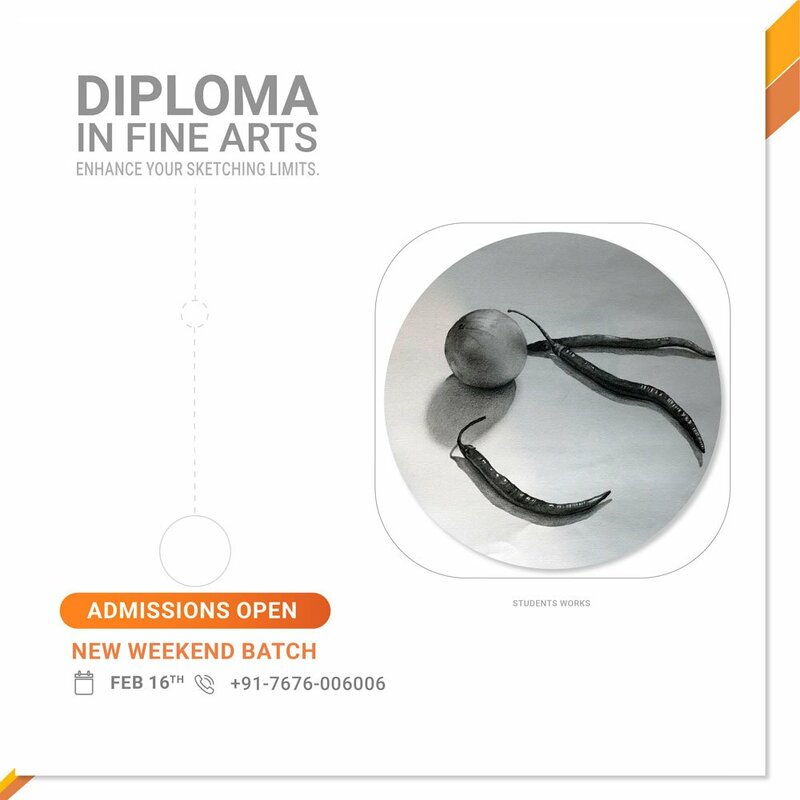 Currently, we offer a Visual Arts Diploma with two modules equivalent to any 2-year diploma in visual or fine arts. Date’s don’t suit? Enroll to our mailing list and we will inform as soon as the next batch open for enrolments. 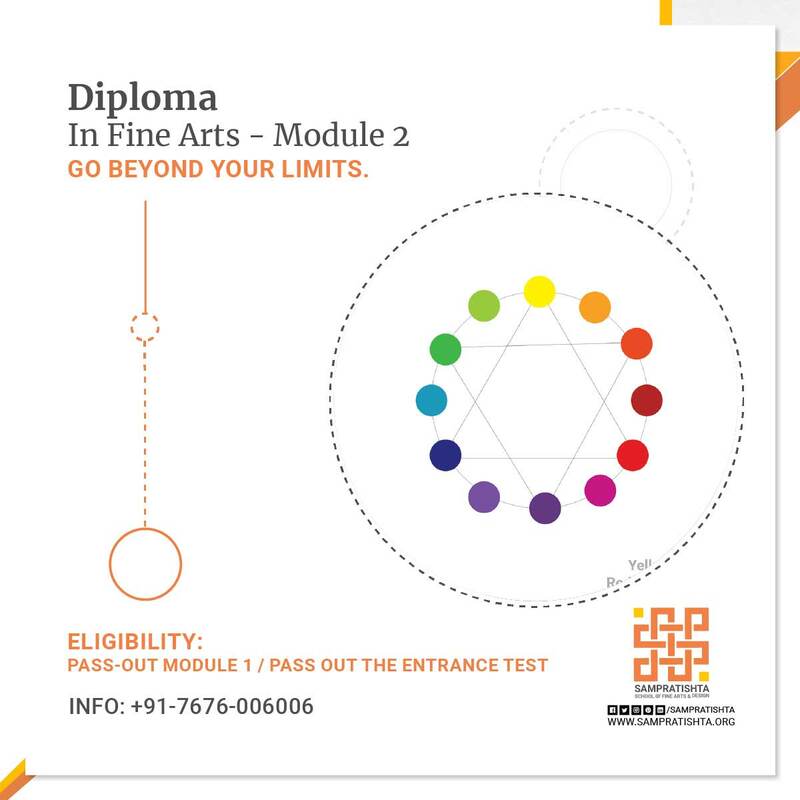 Fine Arts Foundation course offered by Sampratishta School of Fine Arts & Design is for individuals who want to develop a unique style. Besides, it is useful for higher education under fine arts streams. Students benefit by learning different skills, sketching styles and techniques. Not to mention, this helps them develop knowledge and pursue their fine arts career with a higher rate of success. Fine arts refer to the art form that focuses on aesthetic purposes. Our ‘Fine arts foundation course’ is a spartan training that focuses on building a strong foundation for superior sketching, fine arts skills, and understanding complex principles. Besides, it involves developing art and design techniques using the Monochromatic medium. We consolidate the courses with crucial topics essential to provide a sturdy foundation. Also, we teach the key sketching techniques in depth. Thus, a student can develop the most effective skills to produce artwork. We expose our students to greater levels of understanding with this training. As a matter of fact, they advance in sketching along with fine arts skills. Our faculty comprises top-notch artists dedicated to imparting and help the students in career progression. Foundation Course Certificate from the institute. Please note, it is not affiliated to any university yet. Your successful course term proffers a diploma certificate from the institution. Currently, we offer Visual Arts Diploma with two modules, which is equal to any 2year diploma in visual arts or fine arts. To get admissions to this module you need to pass out the first module. Fine arts refers to the art form that focuses on aesthetic purposes. Our ‘Fine arts foundation advanced ’ is an application based training that focuses on building a strong foundation for greater paintings, fine art skills, and understanding. It involves developing art and design techniques by playing with colors. Applications are different based on the different types of media that are used. for paintings and developing the most effective skills to produce an artwork. Enrollment to this course is limited to the students passing out from Module 1 or getting a special permission from faculties after the entrance test.